Are you tired of shallow faith? Do you long for something more in your relationship with God? All you need to do is open yourself to the gift that God extends to you already. Trevor Hudson says, "The Holy Spirit is deeply at work within you, right at this moment, wherever you are." Hudson, a beloved pastor and speaker, shares his own struggles and joys in seeking to be more responsive to the Holy Spirit. He invites you to open yourself to this gift of God. Realize the power of God's presence right here, right now. What you'll enjoy most is Hudson's winsome personal stories that fill each chapter. It's clear after reading, he's someone who lives by the Spirit, not just writes about it. His generous and loving life is apparent on every page. Difficult topics get explained simply and simple topics get explained profoundly. Only someone who's lived life 'with-God' can unpack it so well. 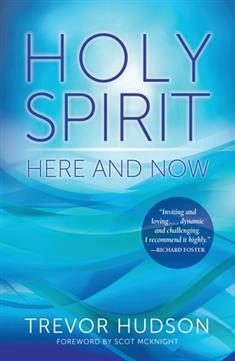 Holy Spirit Here and Now teaches what the Spirit is doing in and through you. The wisdom inside its pages brought clarity and practicality to my own journey into Spiritual Formation. Trevor Hudson's use of story and scripture brings the Holy Spirit front and center and invites us to a life of interactive relationship with this member of the Trinity. It's as if you've pulled up a chair close as he shares from his personal experience and intimate friendship with the Spirit.